On top (left to right): 1. 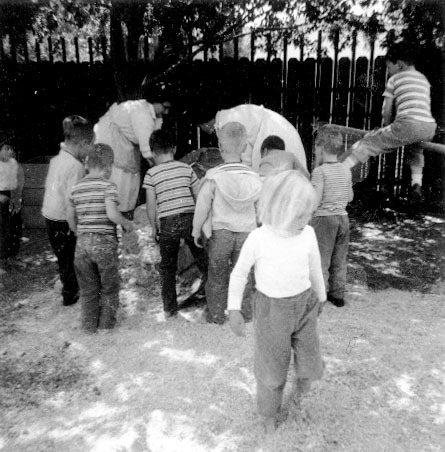 Matt Hamm (sitting on a rung, in a striped shirt and shorts), 2. Brian McFann (standing on a rung), 3. Paul Hurdlow (behind McFann), 4. Brian Odell (sitting on the top rung). Part way up: 1. Lisa Tveitmoe (climbing with her back to the camera), 2. John Heron (standing partway up, in a striped shirt and jacket). At ground level: 1. Roger Cecil, 2. Leah Fairbrother, 3. Matt Bandtel, 4. Beth Jordan. From the collection of Roger Cecil. Left to right: 1. Steve Taylor, 2. Lori Trublood, 3. Paul Hurdlow, 4. Leah Fairbrother? (holding doll), 5. Lisa Tveitmoe. 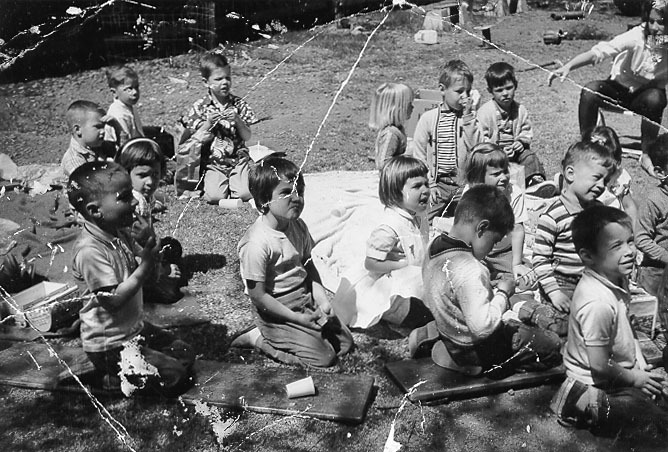 Paul Hurdlow (on the left with his finger in his mouth), Barbara Mills (behind and to the right of Paul), Mark Marion (behind and to the right of Barbara, holding something in front of him), Brian McFann (on the far right), Steve Tracy (behind McFann, in the striped shirt), Brian Odell (behind and to the left of McFann), Roger Cecil (in back, on the right side of the picture, in a striped shirt and sweater, with his hand in his face), and I am guessing that the blonde girl to the left of Roger is Lisa Tveitmoe. The woman in the upper right corner of the picture is Patty Cruff. From the collection of Brian McFann. Jon Tullis is sitting in Patty's lap. 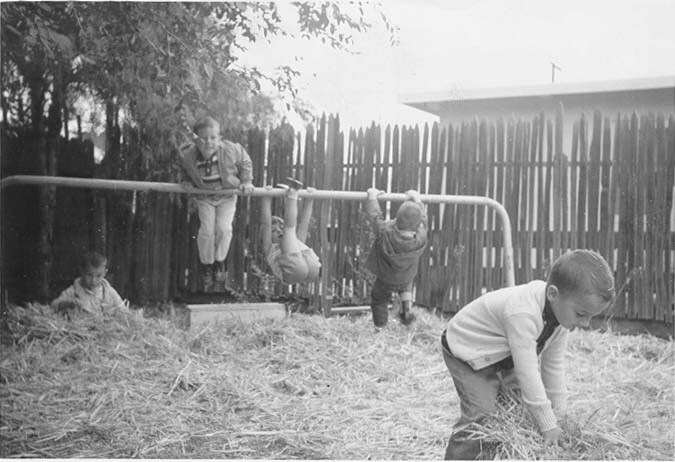 The bar was installed during the year and we spread hay underneath. Left to right: 1. John Heron (with the wheelbarrow), 2. 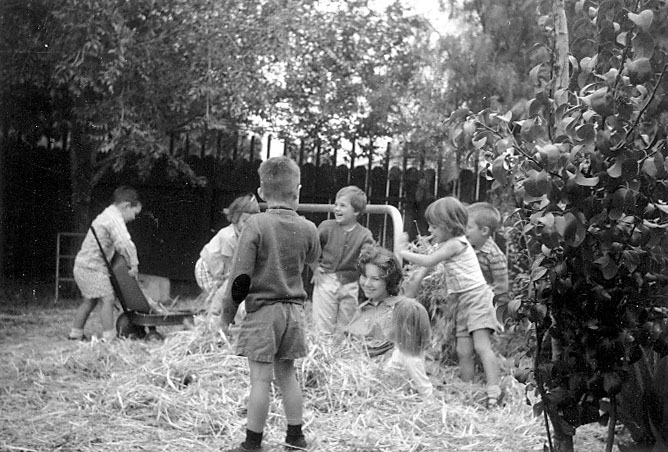 Barbara Mills, 3. unidentified (with his back to the camera), 4. unidentified (looking to the left), 5. unidentified (adult being buried in the hay). Paul Hurdlow is in the foreground. 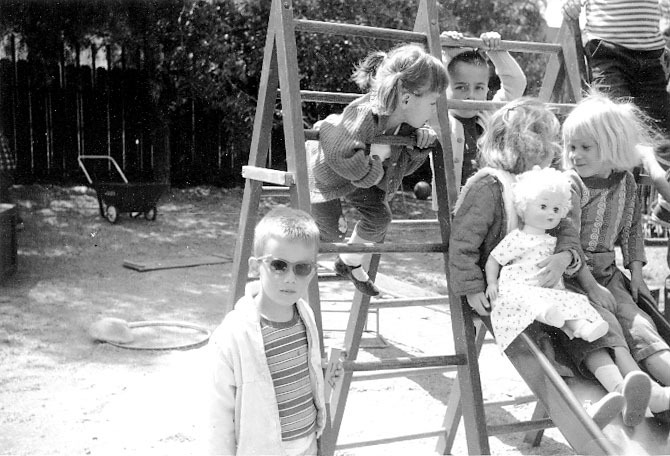 The kid sitting down in the back might be Brian McFann. The boy on the bar, facing the camera, in the striped shirt, is Matt Hamm. Catherine Ratcliffe thinks the girl hanging from the bar is her sister, Jean Ratcliffe. 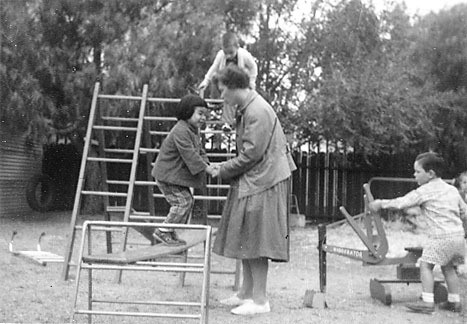 Janice Wong and Mary Maenchen playing, Paul Hurdlow is climbing the structure behind them, while John Heron operates the "diggerator". The pictures were submitted by Brian McFann and Roger Cecil. 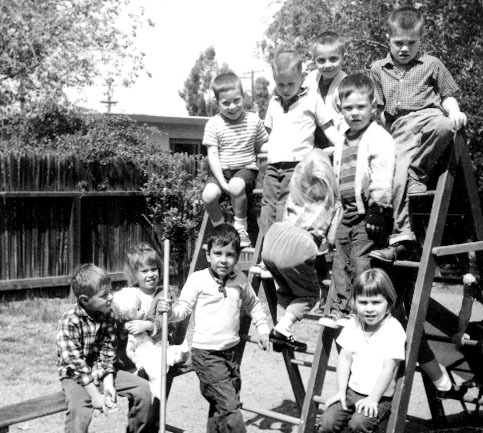 Thanks to Matt Hamm, Catherine Ratcliffe, Barbara (Mills) Nelson, Hugh Cecil, Roger Cecil, Margie (Kirschbaum) Mitchell, Brian Odell, Howie Marion, and Mary Maenchen for identifying the kids in these pictures. Jon Alexander, Matt Bandtel, Roger Cecil, Leah Fairbrother, David Giles, Matt Hamm, John Heron, Carol Hudgins, Paul Hurdlow, Beth Jordan, Carl Latkin, Mark Marion, Brian McFann, Barbara Mills, Brian Odell, Jean Ratcliffe, Rodney Schell, Steve Taylor, Steve Tracy, Lori Trublood, John Tullis, Lisa Tveitmoe, Alice Wong. Carol Gay Anderson, Clifford Bloom, Bruce Boer, Minot Clements, William Corbett, Laura Diaz, Leslie Harrison, Steve Herbst, Jonathon Jaech, Karloa Johnson, Margie Kirschbaum, Nora O'Brien, David Soto, Pauline Stahl, Jill Tobin, Lori Trublood, Jon Tullis, Lori Vik, Constance Wainwright, Mark Williams, Bruce Zimmerman. Mary Maenchen, Jane Southwick, Mary Hurdlow, Mirium Miller, Myra Latkin, Carol Bottomly. These class lists were supplied by Mary Maenchen. Most of the kids in the pictures are members of the high school graduation class of 1977. To find other pictures of the class of 1977 in the archive, see Livermore class pictures listed by year of high school graduation: 1977. And if you have any pictures of the class of 1977 that you would like to share, please submit them to the Archive. 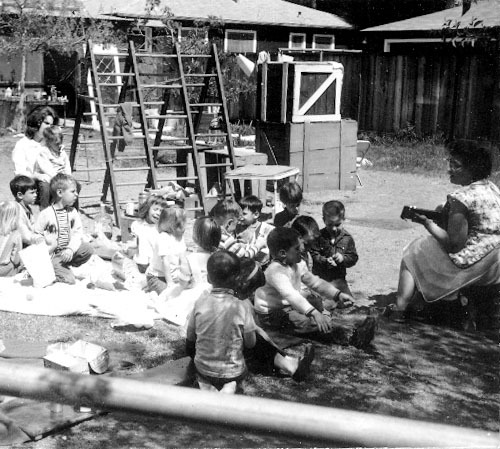 To find other pictures from Mary's Nursery School in the archive, see Livermore class pictures listed by school: Mary's Nursery School. And if you have any pictures from Mary's Nursery School that you would like to share, please submit them to the Archive.